The Dynablend Clean high power home blender gives you all the performance of expensive commercial blenders, but at half the price. Glass Pitcher -Unlike other plastic blenders, Dynablend comes standard with an elegant, heavy-duty tempered glass pitcher. Stainless Steel Scoop - It's also the only blender equipped with an innovative stainless steel utility scoop. Use the stainless steel utility scoop to sample, stir, and add ingredients while in use. Versatile - Three pre-programmed buttons and a variable speed dial provide a simplistic yet more effective approach to most modern blenders. 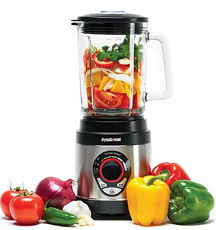 Variable Pulse Modes - Finally, you can obtain the exact texture you want for your smoothies or sauces. The innovative 30-second pulse mode prevents the blades from creating air pockets, while the 60-second blend mode gives you one-touch convenience when making simple recipes. Use the additional 60-second combo mode for even tougher blending jobs. Solid LED Light when switched to "ON"
half the price of competitors.